Network Structure, Export Stimuli, Vicarious Internationalization Knowledge, Export Intensity, Emerging Economies. In the last two decades, research related to drivers that lead to higher export intensity in SMEs has made great strides (Agnihotri & Bhattacharya, 2015; Alvarez, 2004; Singh, 2009; Sousa et al., 2008; Tan & Sousa, 2011). However, the research on export performance is still under maturity, shows mixed and contrary results, and is specially scant in developing countries (Chen et al., 2016; Sousa et al., 2008; Wright et al., 2005). Upon reviewing the existing internationalization research literature on export intensity, the following contributions and research gaps were identified. First, scholars find mixed results about the impact of the network structure on the export intensity of the firm (Coviello, 2006; Hinttu et al., 2004). Therefore, there has been calls for having a deeper understanding about the circumstances in which strong or weak ties are more beneficial to spur the exports of SMEs (Coviello, 2006; Hinttu et al., 2004; Kontinen & Ojala, 2011). Second, current research has recognized the need of clarifying the impact of export stimuli on export intensity (Acedo & Galan, 2011). Most of the literature on international entrepreneurship stressed that export intensity is positively affected by internal stimuli, such as having competitive advantages and proactive stimuli (Andersson et al., 2002; Chandra et al., 2012; Katsikeas, 1996; Sequeira et al.,, 2007; Sharma & Blomstermo, 2003). However, in yet contrast, more recent studies show that the combination of external stimuli and reactive stimuli spur exports (Dimitratos et al., 2010; Prashantham, 2004; Vanninen et al., 2017). Third, although several scholars have demonstrated the positive impact of the vicarious internationalization knowledge on export intensity (Schwens & Kabst, 2009), it is not clear why firms acquire these knowledge from their network and not from government advisors and consultants, or vice versa (Fletcher & Harris, 2012; Lederman et al., 2016; Schwens & Kabst, 2009). A fourth gap to be noted concerns the methodology employed to identify drivers for export intensity (Chen et al., 2016). Despite substantial research on export intensity, little is known about which specific configurations of conditions lead to higher levels of export intensity (Bianchi & Wickramasekera, 2016). Most of the studies are correlational in nature and symmetrical in their analyses. They identify how individual independent variables relate to the outcome (dependent variable). These methods are appropriate when sufficiency and necessity occur simultaneously. Nevertheless, the outcome of export intensity may arise from a variety of different combinations of antecedents (Chen et al., 2016). Therefore, fuzzy-set Qualitative Comparative Analysis (fsQCA) is more suitable because it help us to identify patterns of causal conditions that produce the outcome. Finally, most studies are based on SMEs that are located in developed economies, and few studies focus on emerging economies (Chen et al., 2016; Sousa et al., 2008). Due to the socio-economic differences between developed and emerging economies, there have been several calls to conduct studies in the emerging economies context (Knight & Liesch, 2016; Marquis & Raynard, 2015; Paul et al., 2017; Rottig, 2016). In order to address the aforementioned literature gaps, there is a need to use a conjectural causality analyses with a view to identifying multiple causal relations that lead to high export intensity. Therefore, we used fsQCA to explore the multiple configurations that can explain high export intensity of exporting SMEs based on Colombia. For the purpose of this study, we analyzed 16 cases of Colombian SMEs. Particularly, following several studies, we measured export intensity by the share of exports in total sales (López & García, 2005; Pla-Barber & Alegre, 2007). We also explored the network structure of the firm, identifying if it has strong or weak ties (Granovetter, 1973). We inquired if the company had external or internal stimulus, and proactive or reactive behaviors (Cavusgil, 1980; Leonidou et al., 2007; Morgan, 1997). Finally, we identified the source of vicarious internationalization knowledge, according to the guidelines set by Fletcher and Harris (2012). Our results suggest that no single path leads to high export intensity. The first configuration of conditions shows that the combination of network relationships as a source for vicarious internationalization knowledge, strong ties, internal stimuli, and a proactive behavior are determinant for export intensity. It also shows that vicarious knowledge acquired from government advisors or consultants, combined with weak ties, external stimuli, reactive behavior, generates high export intensity. This study enhances the international business literature in three important ways. First, this research offers contextualized findings that identify the causal conditions that are sufficient for the presence of high export intensity among SMEs. We developed a grounded model that linked the various concepts and patterns that emerged. Second, we complement the scarce literature on SMEs that are located in developing countries (Chen et al., 2016; Sousa et al., 2008). Finally, our study suggests that export intensity might not be fully explained by conventional statistical analysis due to the complexity of this phenomenon. The novelty of our approach is that we a using a novel method in management research that have the potential to solve this problem (Fiss, 2011). From practical perspective, our study suggests that government export programs should take into account the network structure and the export stimuli of the firm to increase exports. Moreover, firms might follow either of the two configurations paths to achieve higher export intensity rates. The study is structured as follows: the first section provides a literature review, focused on vicarious internationalization knowledge, network structure, export stimuli, and its impact on export intensity. The next section explores methodological aspects of the research. Thereafter, the findings are discussed in light of the current literature and the collected data. Finally, the concluding section outlines the implications of the study for policymakers and government internationalization support programs, and some of its limitations. Past research show that export performance is positively impacted by networks (Oviatt & McDougal, 1994). It happens because networks are a source of internationalization knowledge (Chetty & Agndal, 2007; Hadley & Wilson, 2003), contributes to identifying business opportunities (Chetty & Agndal, 2007; Ellis, 2000; Harris & Wheeler, 2005), and furthermore, permits easing the internationalization process of the firm (Chen, 2003; Chetty & Blankenburg- Holm, 2000b; Dimitratos et al., 2014; Harris & Wheeler, 2005; Narooz & Child, 2017; Zhou et al., 2007). However, depending on the network structure these benefits can diverge. Granovetter (1973) considers that the structure of the network can be classified into having strong or weak ties, depending on the amount of time, emotional intensity, and intimacy of the relationship. On one hand, companies with strong ties are characterized by being close, having mutual trust, respect, and emotional ties, and showing high commitment (Söderqvist & Chetty, 2013). On the other hand, weak ties are characterized by having weak trust, not knowing each other well, and having no emotional ties (Söderqvist & Chetty, 2013). It has been demonstrated that strong ties are a source of redundant vicarious internationalization knowledge, while weak ties are a source of novel vicarious internationalization knowledge (Andersson et al., 2002; Chandra et al., 2012; Sequeira et al., 2007; Uzzi, 1997). Moreover, it is easier to transfer complex knowledge in the strong ties than in the weak ones (Andersson et al., 2002; Sharma & Blomstermo, 2003). For these reasons, strong ties have a positive impact on export intensity (Ciravegna et al., 2014). However, the novel information shared within weak ties, contribute to international opportunity identification and therefore, spur export intensity (Hinttu et al., 2004; Oviatt & McDougal, 2005; Sharma & Blomstermo, 2003). Due to the mixed results, there is an need to clarify in which circumstances strong or weak ties are more beneficial to spur the exports of SMEs (Coviello, 2006; Hinttu et al., 2004; Kontinen & Ojala, 2011). From the network relationship perspective, vicarious internationalization knowledge is a relevant aspect in the Uppsala School (Johanson & Vahlne, 2009) and Born Global models (Oviatt & McDougal, 1994). The aforementioned models assert that internationalization knowledge is acquired through networks, which in turn, help organizations to overcome the lack of resources that are needed for their internationalization (Chetty & Blankenburg-Holm, 2000; Coviello & Cox, 2006; Sharma & Blomstermo, 2003; Zhou et al., 2007). Specifically, the Uppsala School claims that a firm gains knowledge through networking; in other words, a company can use networks to learn from their experience in a vicarious way (Johanson & Vahlne, 2009). Similarly, the Born Global-model argues that networks also support internationalization by providing firms with the opportunity to learn about international financing, market access, and distribution channels (Coviello, 2006). It happens because firms can acquire complex knowledge such as the internationalization knowledge by means of the observation and network knowledge sharing (Davis & Luthans, 1980; De Clercq et al., 2014). Both models assert that vicarious knowledge is positively related with the export performance of the company (Schwens & Kabst, 2009: 2011). Besides networks, government advisors and consultants are also a source of vicarious internationalization knowledge. It has been shown that government advisors and consultants have a crucial role in helping SMEs to access this type ok knowledge and as a consequence, to reduce the uncertainty and risk of the first exporting process (Oparaocha, 2015). Moreover, government advisors help firms to improve their internal and external resources to successfully reach internationalization (Leonidou et al., 2011). Additionally, there is a positive relation between the vicarious internationalization knowledge provided by government advisors or consultants and the export intensity of the firm (Cadot et al., 2015; Cansino et al., 2013; Lederman et al., 2016). Finally, it seems that SMEs usually acquire more vicarious internationalization knowledge from government advisors and consultants than from their network relationships (Fletcher & Harris, 2012). A possible explanation for the mixed results might lie in the fact that the ability to aquiere vicarious knowledge vary among firms (Cohen & Levinthal, 1990). It also depends on the structure of its network and its impact on its internationalization decisions (Ahuja, 2000; Coviello, 2006). Up to date, initial motives for exporting have been conceived as a series of stimuli, which are categorized into internal and external stimuli (Cavusgil, 1980; Morgan, 1997), and proactive and reactive stimuli (Leonidou et al., 2007). An internal stimulus depends on the company’s capacity, while an external stimulus relies on its environment. For instance, the strategy, inventories, and competitive advantage are internal stimuli. Thus, studies that focus on the internal stimulus focus primarily on the resource-based view approach (Chen et al., 2016). This approach predicts that export intensity depends on the firm's internal resources and capabilities (Chetty & Agndal, 2007; Dimitratos et al., 2010; Madsen & Servais, 1997; Oviatt & McDougal, 1994). Conversely, external stimuli depend on external forces such as unsolicited foreign requests, variations in the exchange rate, and public entities (Tan et al., 2007). Likewise, proactive stimuli are defined as strategic-oriented and aggressive behaviors that firms pursue to find internationalization opportunities (McDougal et al., 2003). In contrast, reactive stimuli are described as defensive and passive behaviors that companies follow when opportunities appear (Hollensen, 2008). For example, enterprises that are interested in going abroad to create economies of scale, capture growth opportunities or reduce costs are proceeding with a proactive stimulus. Traditionally, most of the researchers have shown that only the most competitive firms can go international (Boehe et al., 2016; Chen et al., 2016), because they need internal capacity to identify and exploit opportunities to overcome liability of foreignness (Zaheer, 1995). However, studies about companies that are located in emerging economies have found out that international SMEs not always had competitive advantages (Shinkle & Kriauciunas, 2010). Firms that are interested in going abroad to meet unexpected foreign orders, or as a reaction to a change in competition, are proceeding with a reactive stimulus. The previous explanation suggests that an external stimulus, such as unexpected international orders, generates a reactive stimulus to firms that will try to satisfy the new demand, and as a consequence increase its export intensity (Bell, 1995; Coviello & Munro, 1997; Dimitratos et al., 2010; Prashantham, 2004; Vanninen et al., 2017). This is especially important during the first stage of internationalization (Dominguez & Mayrhofer, 2015). However, subsequent research observed that internal stimuli usually led to proactive responses and also increased the company’s export intensity (Katsikeas, 1996). For example, several studies have found that a proactive stimulus has a positive effect on export intensity, while a reactive stimulus might decrease the export intensity (Baldauf et al., 2000; Dimitratos et al., 2010). Moreover, Chinese SMEs that show proactive behavior have quickly reached higher export intensity (Ciravegna et al., 2014). Indeed, the traditional definition of international entrepreneurship is based in the proactive behavior of the firm (McDougal & Oviatt, 2000). Clearly, there is a need to develop a new research that might clarify these contradictory findings. This literature review shows important literature gaps that should be addressed. First, there are mixed and contrary results about the drivers that lead to higher export intensity in SMEs (Chen et al., 2016); thus, the scholarship is still divergent and discordant (Sousa et al., 2008; Tan & Sousa, 2011), although it has been demonstrated that vicarious internationalization knowledge has a positive impact on export intensity. There is still an open debate about which source of vicarious knowledge has a greater impact, either network relations or government advisors or consultants. Moreover, it is not clear which network structure is more beneficial to export intensity, or if they are strong ties or weak ties. Finally, much work remains to advance scholarship on the impact that export stimuli have in export intensity. Specifically, there is an open question about which combination of stimulus results in higher export intensity. Despite the aforementioned literature gaps, most of the studies are based on correlational analyses (Chen et al., 2016); this means that the past research is only able to show the contribution of each variable to the outcome (Fiss, 2011). Therefore, there is a need to use a conjectural causality analyses in order to identify multiple causal relations that lead to high export intensity. Second, the stream of research about vicarious internationalization knowledge, network structure, and export intensity, draws our attention to the fact that most studies are based on SMEs that are located in developed economies; there are only few studies focusing on emerging economies (Chen et al., 2016; Sousa et al., 2008). Emerging economies differ from developed economies in aspects such as political environments, regulatory frameworks, and institutional voids (Khanna & Palepu, 2000; Marquis & Raynard, 2015; Rottig, 2016); thus, more studies should focus on SMEs in the context of emerging economies (Knight & Liesch, 2016; Paul et al., 2017), with special attention on the factors that influence export intensity (Agnihotri & Bhattacharya, 2015). Hence, the present study outlines and tests the casual relations that vicarious internationalization knowledge, network structure, and export stimuli have on export intensity on SMEs from emerging economies. With regard to the methodology, this study used a fuzzy set qualitative comparative analysis approach (fsQCA), method that was used to analyze the selected cases for several reasons: first, fsQCA is a pragmatic way to study complex configurations of constructs, especially in situations with multilevel explanations and influences (Woodside, 2013). Second, the fsQCA assumes asymmetry between independent and dependent variables and its relations in terms of set membership, identifying the necessary and sufficient conditions for an outcome of interest (Ragin, 2008). Finally, fsQCA is appropriate when analyzing a small sample of cases (Rihoux & Ragin, 2009). FsQCA has three steps. In the first step of the fsQCA analysis, the variables were calibrated into fuzzy-set membership scores relying on applicable and substantive empirical studies (Fiss, 2011). Once the variables were calibrated, the second step involved constructing a “truth table” in order to identify the configurations that are enough to achieve high export intensity from those that are not. Finally, the third step consists in recognizing which combinations of conditions exhibit high scores for their respective outcome (Fiss, 2011). The subsequent sections provide additional information about the research method and data used in this study. The data was collected by means of a qualitative method with an exploratory approach for the following reasons (Yin, 2008): first, it was applied because of its relation with the aim of the research in this article; moreover, because this method is specifically used to analyze the internationalization path of SMEs and its behavior (Dubois & Gadde, 2002). Also, recent literature has pointed towards the importance of investigating more case studies (Welch et al., 2011), especially SMEs located in developing economies (Haddoud et al., 2017; Hånell & Ghauri, 2016). Following Galkina & Chetty, (2015), replication logic and purposeful sampling was employed. It means that cases were selected purposively rather than through random sampling. The firms were identified with the assistance of members of the Internationalization promotion area of the Bogotá Chamber of Commerce who was familiar with Colombian export firms. Cases were selected purposively to ensure variance in the network structure, the export stimuli and the source of the vicarious knowledge. Moreover, the criteria for selecting the case firms were SMEs with less than 250 employees, international operations and willingness to participate in the study. After this process, 16 cases of exporting SMEs located in Colombia were selected. The information was collected through interviews, with open-ended questions according to Wright et al. (2015) guidelines. The focus in doing the interviews was to achieve decisions and actions adopted by firms during their internationalization process. For this purpose, a semistructured interview protocol was developed to capture the internationalization process of the companies. In order to avoid the bias of only observing the network structure, the export stimuli and the source of the vicarious knowledge, general questions were asked first. Later on, specific questions regarding our focus of the study were asked. For instance, in several cases, the specific information about internal and external stimuli was revealed during the first part of the interview and confirmed later through the specific questions. During data analysis, all firms provided evidence supporting the information revel during the interview. Finally, basic background information about the firm was provided. For example, the number of employees, average sales per year, share of exports in total sales. To preserve confidentiality, name of the companies have been removed. Table 1 shows the main features of firm samples in this study. Each interview lasted between 70 and 100 min, was recorded, and later transcribed. Both, the interviews and the transcriptions, has been done by one person, one of the authors of this article. The interview transcripts were combined with secondary sources and documentary evidence to produce a detailed case history of each firm. Colombia was chosen as the focus of analysis of emerging economy, because although SMEs account for 99% of the total number of enterprises and it is one of the most exportoriented economies in Latin America, SMEs only represent 9% of Colombian exports (Confecámaras, 2016). Moreover, Colombia has one of the highest rates of medium-to-high growth-oriented entrepreneurs among the emerging economies (Kelley et al., 2016); hence, Colombia sets the right context for the study. In the present study, the outcome is export intensity and was measured by the share of exports in total sales (López & García, 2005; Pla-Barber & Alegre, 2007). The causal conditions are network structure, export stimuli and source of the vicarious internationalization knowledge. We measure the network structure of the firm, according to Granovetter's (1973) definition. Thus, we operationalize network structure using subjective measures reported by the respondents. We ask the interviewers about the type of relationship they had with their networks in terms of emotional ties and knowledge about each other. Following Leonidou et al. (2007), we inquired about the export motivations of the firms and classify the information into external or internal stimulus (Cavusgil, 1980; Morgan, 1997), and proactive or reactive behaviors (Leonidou et al., 2007). Finally, we explored the source of vicarious internationalization knowledge, by asking if the firm acquired internationalization knowledge from its networks or from advisors (Fletcher & Harris, 2012). In fsQCA method, data are transformed into fuzzy membership scores ranging between 0.00 (full non membership) to 1.00 (full membership), in which 0.5 illustrates the crossover point and maximum ambiguity (Rihoux & Ragin, 2009). We use this method to calibrate the network structure (fs_nets), the external or internal stimuli (fs_exts), the proactive or reactive stimuli (fs_pros) and the source of vicarious internationalization knowledge (fs_sovk). The next step is to use the fsQCA truth table algorithm to generate different combinations of causal conditions that are sufficient for achieving high export intensity. By setting the consistency cutoff value to 0.8 this study distinguishes between configurations that are sufficient for the outcome and those that are not (Fiss, 2011; Woodside, 2013). The third step is to indicate which configurations show high scores to the respective outcome. This can be achieved in three different ways; through the complex solution; through the parsimonious solution; and through the intermediate solution. This paper presents the intermediate solution, because intermediate solutions are superior to both complex and parsimonious solutions (Ragin, 2008). We apply the intermediate solution to explore the configurations of the source of vicarious internationalization knowledge, the network structure, and export stimuli on SMEs' export intensity. The analysis performed with the fsQCA 2.5 software yields two combinations of sufficient causal conditions in the intermediate solution. This solution is chosen because it is superior and has considerable benefits over the complex solution and the parsimonious solution (Rihoux & Ragin, 2009). Table 2 shows the combinations of these causal conditions. Black circles indicate the presence of a causal condition and white circles indicate the absence or negation of a condition. These are common denominations in the presentation of fsQCA results. The outcome includes measures of coverage and consistency for each causal configuration. Consistency is similar to the metrics used in statistical hypothesis testing. Coverage measures the extent to which the configurations lead to high export intensity (Woodside, 2013). Note: Black circles indicate the presence of a causal condition and white circles indicate the absence or negation of a condition. [fs_nets]=network structure (weak or strong ties); [fs_exts]=external or internal stimuli; [fs_pros]=proactive or reactive stimuli; [fs_sovk]=source of vicarious internationalization knowledge (Network relationships or government advisors and consultants). Source: Prepared by the Authors. The overall solution consistency is 0.90, showing a strong relationship between the combinations and the outcome (Fiss, 2011; Woodside, 2013). Similarly, the two solutions achieve high export intensity with sufficient consistency (≥ 0.8). According to the raw coverage, the overall solution is 0.288; solution 1 accounts for 0.128 and solution 2 for 0.16. Low coverage means, that although the relationships are consistent, they only apply to a reduced number of firms. It also means that various causal paths lead to high export intensity. This happens because exporting is a complex activity that is governed by different causes (Bernard et al., 2011). Indeed, more than 700 variables might explain export intensity (Gemunden, 1991). This finding is important because conventional statistical analysis is not sufficient to fully explain high export intensity; thus, the combinations are a perfect subset of the initial solutions (Schneider & Wagemann, 2010). Using fuzzy-set qualitative comparative analysis, this study identifies configurations that lead to export intensity for SMEs located in Colombia. Configurations are combinations of: (1) source of vicarious internationalization knowledge, (2) network structure, and (3) export stimuli. 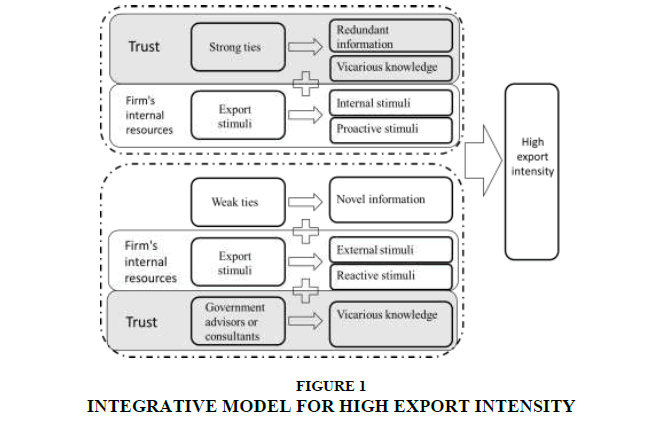 The first configuration shows that firms can achieve high export intensity by having strong ties, internal stimuli such as a competitive advantage, a proactive behavior to find internationalization opportunities, and by using their network relationships to acquire vicarious internationalization knowledge. This configuration indicates that although strong ties are a source of redundant knowledge, the firm can use the complex knowledge gain from its network relationships, its competitive advantage, and its international strategic-oriented and aggressive behavior to successfully increase its exports. In an opposite direction, the second configuration shows a more novelty path. It indicates that weak ties, combined with external stimuli, reactive behavior, and vicarious knowledge acquired from government advisors or consultants, results in high export intensity. In other words, the receipt of external stimuli such as unsolicited foreign requests, trigger a reactive stimuli in the firms that leads them to acquire vicarious knowledge from government advisors or consultants. The combination of these causal conditions is consistent with the literature on international entrepreneurship (Andersson et al., 2002; Chandra et al., 2012; Katsikeas, 1996; Sequeira et al., 2007; Sharma & Blomstermo, 2003). They have concluded that each casual condition itself is a driver of export intensity. However, as far as we know, none of them have investigated the aggregated impact of the combination of these conditions, as we have done. The findings offer a solid foundation for the development of an integrative model with the combinations of conditions that leads to high export intensity (Figure 1). As depicted in Figure 1, trust and the firm's internal resources play a central role in export intensity. Specifically, the findings suggest that depending on the network structure the source of the vicarious internationalization knowledge changes (Ahuja, 2000; Coviello, 2006). Vicarious knowledge is acquired by learning from the experience of others and by working closely with them (Schwens & Kabst, 2009). Therefore, trust is a necessary factor that might explain the source of vicarious internationalization knowledge. Indeed, there has been considerable recent work relating the focal role of trust as force for export performance (Barnes et al., 2015; Bloemer et al., 2013; Leonidou, et al., 2014). Because network relationships with strong ties have mutual trust, respect, and emotional ties, they become a source of vicarious internationalization knowledge (Chandra et al., 2012). However, in the case of firms that have weak ties, in which trust is weak, they need to find another source. Our results suggest that government advisors or consultants generate the necessary trust to become a source of vicarious internationalization knowledge. The findings also suggest that the difference in the firm's internal resources also effect the causal configurations to achieve high export intensity. According to the resource-based view approach and the network approach, export intensity depends on the firm's internal resources (Chetty & Agndal, 2007; Dimitratos et al., 2010). Therefore is expected that SMEs rely on their internal capabilities (internal stimuli) to internationalice. In the cases, in which firms have strong ties and internal capabilities, they proactively take advantage of their network to obtain vicarious internationalization knowledge. For this reason, the SMEs that follow this path show proactive stimuli. While in the cases, in which the company have weak ties depend more on external forces. Because weak ties are a source of novel information (Chandra et al., 2012; Sequeira et al., 2007), these companies use their weak network relationships to find international opportunities. Once they find it, they respond with reactive stimuli. They also rely on government advisors or consultants to improve their internal capabilities to successfully reach internationalization (Leonidou et al., 2011). This study offers a new understanding of which combinations of factors can lead to export intensity of SMEs located in Colombia. Yet, as far as we know, no study has examined the effect of the combinations between the source of the vicarious internationalization knowledge, network structure and export stimuli on export intensity. Each of these factors has been analyzed individually, reaching mixed and contrary results (Sousa et al., 2008). It is not clear which sources of vicarious internationalization knowledge has the greater impact on export intensity (Schwens & Kabst, 2009). Similar, scholars have also found mixed results about the impact of the network structure on the export intensity of the firm (Coviello, 2006; Hinttu et al., 2004). Finally, current research has recognized the need of clarifying the impact of export stimuli on export intensity (Acedo & Galan, 2011). Thus, using fsQCA, the study identifies causal conditions and combinations of vicarious internationalization knowledge, network structures and export stimuli that lead to export intensity of SMEs located in Colombia. By doing so, we also complement the scarce literature on SMEs that are located in developing countries (Chen et al., 2016; Sousa et al., 2008). According to our results, no antecedent condition by itself is sufficient to produce the outcome. Our study uncovers two configurations that explain high export intensity of SMEs located in Colombia. The first configuration indicates that strong ties, internal stimuli, proactive stimuli, and network relationships as source for vicarious internationalization knowledge explain high export intensity. In contrast, the second configuration shows that weak ties, combined with external stimuli, reactive stimuli, and vicarious knowledge acquired from government advisors or consultants increase the export intensity of the SMEs. The preceding analysis leads us to propose an integrative model for high export intensity derived from the findings of the research. The proposed model suggests that trust and the firm's internal resources play a central role in export intensity. The contributions of our study to the literature are threefold. Our first contribution consists of the identification of causal conditions that are sufficient for the presence of high export intensity among SMEs. Secondly, bases on these results, we present an integrative model. Finally, our study suggests that export intensity might not be fully explained by conventional statistical analysis due to the complexity of this phenomenon. Thus, it is advisable to replace the linear measurement models for methodologies consisting of causal configurations and an outcome. By way of practical implications, this study provides guidance for SMEs’ owners who want to increase their export intensity. Depending on the network structure and export stimulus of the SMEs, owners might react in different ways to successfully increase their exports. These finding is also important for policymakers, and specifically for government advisors or consultants in emerging economies. Usually, government promotion programs and consulting intervention are formulated ignoring the network structure or the export stimuli of the firm (ITC, 2015). Thus, in order to improve their effectiveness, we suggest designing different intervention plans, according to these factors. This study contains some limitations that suggest avenues for further research. First, considering the research objective, a qualitative approach was chosen. Therefore, it would be convenient to complement this article with a quantitative approach. Second, as the sample is drawn using Colombian cases, caution should be exercised in generalizing from these findings to other country contexts. Finally, future research should explore other combination of factors that might affect export intensity, such as entrepreneurial characteristics of the CEO, or factors related with the institutional theory. Acedo, F.J., & Galan, J.L. (2011). Export stimuli revisited: The influence of the characteristics of managerial decision makers on international behaviour. International Small Business Journal, 29(6), 648-670. Agnihotri, A., & Bhattacharya, S. (2015). Determinants of export intensity in emerging markets: An upper echelon perspective. Journal of World Business, 50(4), 687-695. Ahuja, G. (2000). Collaboration networks, structural holes, and innovation: A longitudinal study. AdministrativeScienceQuarterly, 45(3), 425. Alvarez, R. (2004). Sources of export success in small and medium-sized enterprises: The impact of public programs. International Business Review, 13(3), 383-400. Baldauf, A., Cravens, D.W., & Wagner, U. (2000). Examining determinants of export performance in small open economies. Journal of World Business, 35(1), 61-79. Barnes, B.R., Leonidou, L.C., Siu, N.Y.M., & Leonidou, C.N. (2015). Interpersonal factors as drivers of quality and performance in western–Hong Kong inter organizational business relationships. Journal of International Marketing, 23(1), 23-49. Bell, J. (1995). The internationalization of small computer software firms: A further challenge to stage theories. EuropeanJournal of Marketing, 29(8), 60-75. Bianchi, C., & Wickramasekera, R. (2016). Antecedents of SME export intensity in a Latin American market. Journal of Business Research, 69(10), 4368-4376. Bloemer, J., Pluymaekers, M., & Odekerken, A. (2013). Trust and affective commitment as energizing forces for export performance. International Business Review, 22(2), 363-380. Boehe, D.M., Qian, G., & Peng, M.W. (2016). Export intensity, scope, and destinations: Evidence from Brazil. Industrial Marketing Management, 57, 127-138. Cadot, O., Fernandes, A.M., Gourdon, J., & Mattoo, A. (2015). Are the benefits of export support durable? Evidence from Tunisia. Journal of International Economics, 97(2), 310-324. Cansino, J. M., Lopez-Melendo, J., Pablo-Romero, M. del P., & Sánchez-Braza, A. (2013). An economic evaluation of public programs for internationalization: The case of the diagnostic program in Spain. Evaluation and Program Planning, 41, 38-46. Chandra, Y., Styles, C., & Wilkinson, I. F. (2012). An opportunity-based view of rapid internationalization. Journal of International Marketing, 20(1), 74-102. Chen, J., Sousa, C., & He, X. (2016). The determinants of export performance: A review of the literature 2006-2014. International Marketing Review, 33(5), 626-670. Chen, T. (2003). Network resources for internationalization: The case of Taiwan’s electronics firms. Journal of Management Studies, 40(5), 1107–1130. Chetty, S., & Agndal, H. (2007). Social capital and its influence on changes in Internationalization mode among small and medium-sized enterprises. Journal of International Marketing, 15(1), 1-29. Chetty, S., & Blankenburg Holm, D. (2000a). Internationalisation of small to medium-sized manufacturing firms: A network approach. International Business Review, 9(1), 77-93. Chetty, S., & Blankenburg Holm, D. (2000b). The role of business networks in the Internationalisation of manufacturing firms: Alongitudinal case study. Advances in International Marketing, 333-355. Ciravegna, L., Lopez, L., & Kundu, S. (2014). Country of origin and network effects on Internationalization: A comparative study of SMEs from an emerging and developed economy. Journal of Business Research, 67(5), 916-923. Ciravegna, L., Majano, S.B., & Zhan, G. (2014). The inception of Internationalization of small and medium enterprises: The role of activeness and networks. Journal of Business Research, 67, 1081-1089. Cohen, W.M., & Levinthal, D.A. (1990). Absorptive Capacity: A new perspective on and innovation learning. Administrative Science Quarterley, 35(1), 128-152. Coviello, N.E., & Munro, H. (1997). Network relationships and the internationalization process of small software firms. International Business Review, 6(4), 361-386. Coviello, N.E. (2006). The network dynamics of international new ventures. Journal of International Business Studies, 37(37), 713-731. Coviello, N.E., & Cox, M.P. (2006). The resource dynamics of international new venture networks. Journal of International Entrepreneurship, 4(2-3), 113-132. Davis, T.R.V., & Luthans, F. (1980). A social learning approach to organizational behavior. The Academy of Management Review, 5(2), 281. De Clercq, D., Sapienza, H.J., & Zhou, L. (2014). Entrepreneurial strategic posture and learning effort in international ventures: The moderating roles of operational flexibilities. International Business Review, 23(5), 981-992. Dimitratos, P., Plakoyiannaki, E., Pitsoulaki, A., & Tüselmann, H.J. (2010). The global smaller firm in International entrepreneurship. International Business Review, 19(6), 589-606. Dimitratos, P., Amorós, J.E., Etchebarne, M.S., & Felzensztein, C. (2014). Micro-multinational or not? International entrepreneurship, networking and learning effects. Journal of Business Research, 67, 908-915. Dominguez, N., & Mayrhofer, U. (2015). Internationalization stages of traditional SMEs: Increasing, decreasing and re-increasing commitment to foreign markets. International Business Review, 26(6), 1051-1063. Dubois, A., & Gadde, L. (2002). Systematic combining: An abductive approach to case research. Journal of Business Research, 55, 553-560. Ellis, P.D. (2000). Social ties and foreign market entry. Journal of International Business Studies, 31(3), 443-469. Fiss, P.C. (2011). Building better causal theories: A fuzzy set approach to typologies in organization research. Academy of Management Journal, 54(2), 393-420. Fletcher, M., & Harris, S. (2012). Knowledge acquisition for the internationalization of the smaller firm : Content and sources. International Business Review, 21(4), 631-647. Galkina, T., & Chetty, S. (2015). Effectuation and networking of internationalizing SMEs. Management International Review, 55(5), 647-676. Gemunden, H.G. (1991). Success factors of export marketing: A meta-analytic critique of the empirical studies. New perspectives on international marketing, Routledge, London. Granovetter, M. (1973). The strength of weak ties. American Journal of Sociology, 78(1), 1360-1380. Haddoud, M.Y., Jones, P., & Newbery, R. (2017). Export promotion programmes and SMEs’ performance: Exploring the network promotion role. Journal of Small Business and Enterprise Development, 24(1), 68-87. Hadley, R.D., & Wilson, H.I.M. (2003). The network model of Internationalisation and experiential knowledge. International Business Review, 12(6), 697-717. Hånell, S.M., & Ghauri, P.N. (2016). Internationalization of smaller firms : Opportunity development through networks. Thunderbird International Business Review, 58(5), 465-477. Harris, S., & Wheeler, C. (2005). Entrepreneurs’ relationships for internationalization: Functions, origins and strategies. International Business Review, 14(2), 187-207. ITC. (2015). The Making of a National Champion. Katsikeas, C.S. (1996). Ongoing export motivation: differences between regular and sporadic exporters. International Marketing Review, 13(2), 4-19. Kelley, D., Singer, S., & Herrington, M. (2016). GEM 2015-2016-global-report. Khanna, T., & Palepu, K. (2000). The future of business groups in emerging markets: Long-run evidence from chile. The Academy of Management Journal, 43(3), 268-285. Knight, G.A., & Liesch, P.W. (2016). Internationalization: From incremental to born global. Journal of World Business, 51(1), 93-102. Kontinen, T., & Ojala, A. (2011). Network ties in the International opportunity recognition of family SMEs. International Business Review, 20(4), 440-453. Leonidou, L.C., Katsikeas, C.S., Palihawadana, D., & Spyropoulou, S. (2007). An analytical review of the factors stimulating smaller firms to export Implications for policy-makers. International Marketing Review, 24(6), 735-770. Leonidou, L.C., Palihawadana, D., & Theodosiou, M. (2011). National export-promotion programs as drivers of organizational resources and capabilities: Effects on strategy, competitive advantage, and performance. Journal of International Marketing, 19(2), 1-29. Leonidou, L.C., Samiee, S., Aykol, B., & Talias, M.A. (2014). Antecedents and outcomes of exporter–importer relationship quality: Synthesis, meta-analysis, and directions for further research. Journal of International Marketing, 22(2), 21-46. López Rodríguez, J., & García Rodríguez, R.M. (2005). Technology and export behaviour: A resource-based view approach. International Business Review, 14(5), 539-557. Madsen, T.K., & Servais, P. (1997). The Internationalization of born globals: An evolutionary process? International Business Review, 6(6), 561-583. Marquis, C., & Raynard, M. (2015). Institutional strategies in emerging markets. The Academy of Management Annals, 9(1), 291-335. McDougal, P.P., & Oviatt, B.M. (2000). International entrepreneurship: The intersection of two research paths. The Academy of Management Journal, 43(5), 902-906. McDougal, P.P., Oviatt, B.M., & Shrader, R.C. (2003). A comparison of International and domestic new ventures. Journal of International Entrepreneurship, 1, 59-82. Narooz, R., & Child, J. (2017). Networking responses to different levels of institutional void: A comparison of internationalizing SMEs in Egypt and the UK. International Business Review, 26(4), 683-696. Oparaocha, G.O. (2015). SMEs and international entrepreneurship: An institutional network perspective. International Business Review, 24(5), 861-873. Oviatt, B.M., & McDougal, P.P. (1994). Toward a theory of International new ventures. Journal of International Business Studies, 25(1), 45-64. Oviatt, B. M., & McDougal, P. P. (2005). Toward a theory of International new ventures. Journal of International Business Studies, 36, 29-41. Paul, J., Parthasarathy, S., & Gupta, P. (2017). Exporting challenges of SMEs : A review and future research agenda. Journal of World Business, 52(3), 327-342. Pla-Barber, J., & Alegre, J. (2007). Analysing the link between export intensity, innovation and firm size in a science-based industry. International Business Review, 16(3), 275-293. Prashantham, S. (2004). Indian perspectives of international entrepreneurship. Handbook of research on international entrepreneurship. Ragin, C.C. (2008). Qualitative comparative analysis using fuzzy sets (fsQCA). Configurational Comparative Analysis, 87-121. Rihoux, B., & Ragin, C.C. (2009). Configurational Comparative Methods: Qualitative Comparative Analysis (QCA) and Related Techniques. SAGE Publications. Rottig, D. (2016). Institutions and emerging markets: Effects and implications for multinational corporations. International Journal of Emerging Markets, 11(2), 2-17. Schneider, C.Q., & Wagemann, C. (2010). Standards of good practice in qualitative comparative analysis (QCA) and fuzzy-sets. Comparative Sociology, 9(3), 397-418. Schwens, C., & Kabst, R. (2009). How early opposed to late internationalizers learn: Experience of others and paradigms of interpretation. International Business Review, 18(5), 509-522. Schwens, C., & Kabst, R. (2011). Internationalization of young technology firms: A complementary perspective on antecedents of foreign market familiarity. International Business Review, 20(1), 60-74. Sequeira, J., Mueller, S.L., & McGee, J.E. (2007). The influence of social ties and self-efficacy in forming entrepreneurial intentions and motivating nascent behavior. Journal of Developmental Entrepreneurship, 12(03), 275-293. Sharma, D.D., & Blomstermo, A. (2003). The Internationalization process of born globals: A network view. International Business Review, 12(6), 739-753. Shinkle, G.A., & Kriauciunas, A.P. (2010). Institutions, size and age in transition economies: Implications for export growth. Journal of International Business Studies, 41(2), 267–286. Singh, D. (2009). Export performance of emerging market firms. International Business Review, 18(4), 1-33. Söderqvist, A., & Chetty, S. (2013). Strength of ties involved in international new ventures. European Business Review, 25(6), 536-552. Sousa, C., Martínez-lópez, F., & Coelho, F. (2008). The determinants of export performance : A review of the research in the literature between 1998 and 2005. International Journal of Management Reviews, 10(4), 343-374. Tan, A., Brewer, P., & Liesch, P.W. (2007). Before the first export decision: Internationalisation readiness in the pre-export phase. International Business Review, 16(3), 294-309. Tan, Q., & Sousa, C.M. (2011). Research on export pricing: Still moving toward maturity. Journal of International Marketing, 19(3), 1-35. Uzzi, B. (1997). Social structure and competition in interfirm networks: The paradox of embeddedness. Administrative Science Quarterly, 42(1), 35. Vanninen, H., Kuivalainen, O., & Ciravegna, L. (2017). Rapid multinationalization: Propositions for studying born micromultinationals. International Business Review, 26(2), 365-379. Welch, C., Piekkari, R., Plakoyiannaki, E., & Paavilainen-Mäntymäki, E. (2011). Theorising from case studies: Towards a pluralist future for international business research. Journal of International Business Studies, 42(5), 740-762. Woodside, A.G. (2013). Moving beyond multiple regression analysis to algorithms: Calling for adoption of a paradigm shift from symmetric to asymmetric thinking in data analysis and crafting theory. Journal of Business Research, 66(4), 463-472. Wright, M., Filatotchev, I., Hoskisson, R.E., & Peng, M.W. (2005). Strategy research in emerging economies: Challenging the conventional wisdom-Introduction. Journal of Management Studies, 42(1), 1-33. Yin, R.K. (2008). Case Study Research: Design and Methods. SAGE Publications. Zhou, L., Wu, W., & Luo, X. (2007). Internationalization and the performance of born-global SMEs: The mediating role of social networks. Journal of International Business Studies, 38, 673-690.